THERE is a farm better than most farms in the low hill lands of eastern Australia. Though located in a sparse rainfall area, it is free from drought and flood, the twin curses of Australia. There cattle grow fat, and a multitude of visitors flock to it as if on a pilgrimage. To bring the reader into the picture, I would like him, before proceeding, to look carefully at these first photographs taken on this farm. It is not usual to have such pasture in the winter-time in the Nevallan district. 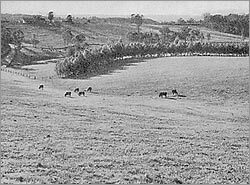 This picture, taken in the winter of 1960, shows how good the pastures were on Nevallan. In the background beyond the fence there are two belts of trees; the nearer was planted in 1953, the other in 1955. In the foreground is the top end of a large irrigation dam, most of which is out of the picture to the left. Upper. In the centre is a farm dam in a primary valley. There are trout in the dam and the water is used for irrigation. The tree belts in the background of the picture were what was left when the paddocks were cleared. A farm road lies above the uppermost tree belt. Lower. The walls of two farm irrigation dams can be seen in the background. In the wall of the nearer dam an eight-inch pipe at A is allowing water to flow along an irrigation drain. See also Plate 8, Page …., showing irrigation. Only the lower three-quarters of this picture is Nevallan. Note the remarkable growth of the tree belt. These trees were planted as six-leaf seedlings in 1953, and at the time of the photograph (1960) were thirty-six feet high. The trees shown here are tallow-woods. They are not the fastest growing trees on the property. Spotted gums planted in 1955 are now taller. There is a mature beauty in the landscapes shown in these four pictures. This is to be remarked upon because these landscapes have been created within eight years out of what was dry and almost barren land. are not indiscriminately scattered and pastures are certainly not poor looking. These paddocks once held most unimpressive looking dirt – it could not be called soil. Now, despite an unfavourable agricultural climate, deep, dark soil supports the pastures, soil that was not there a few short years ago. How has this been brought about? And the beautiful dams, there is something different about them. Their banks are grassed; the water is clear; there appear to be drains leading to the tops of the dams, and other but smaller drains coming out from the very bottom at the back of the walls of the dams. It becomes obvious that these dams and their drains, with the trees, the fences and the roads, follow a pattern, and that the dams will readily catch any rain run-off from the hillsides. The larger taps, or valves, at the back of the dam and apparently placed in the smaller drains, allow water to flow out of the dams, around the ridges and valleys, and down the slopes. Here, on what were barren, eroded slopes and deeply gullied valleys, which earlier were thought to have no water resources for such purposes as irrigation, there is now a large area of irrigated land which covers almost half of the entire property. Most of the water comes from that which actually falls as rain on the property. a harmonious, satisfying and, with all, a highly productive, enterprise. This farm belongs to Mr P.A. Yeomans, and is the home farm of Keyline. Situated at North Richmond, New South Wales, it lies on the outer edge of the County of Cumberland, the county which includes the city of Sydney and the surrounding country. The farm is divided into two parts, one called “Yobarnie” and the other “Nevallan”. They look different and are very markedly so, because of their history and the way they have been worked. And so they will be referred to as district entities. When we look into the development of this combined farm, we find many contradictions against conventional agricultural practices. For instance, the many clovers and grasses of the pasture appear to be in extraordinarily good condition. The green of the grass is healthy looking and the soil beneath the pasture is almost black. It could be thought that the soil was always like that, and that artificial fertilizers have been used profusely, but such is not the case. These orthodox aids to good pasture have been sparingly used, and only for the initial sowing of the seeds of grasses and clovers. This attitude toward the use of fertilizers is uncommon and differs markedly from that of most farmers. The finest pastures on these properties have had only one hundredweight of superphosphate per acre, which was sown with the seeding eight years ago. This amount could be considered ridiculously low for such country, when orthodox recommendations for much better land than this would be a minimum of one hundredweight of superphosphate per acre each year. There is plenty of white clover throughout the irrigated areas of these farms, but strangely enough there appears to be just as much in the non-irrigated rain pasture, which is surely remarkable in the types of soil found in the outer areas of the County of Cumberland. was once almost dry land has now an amazing development of water resources. Likewise, the once shallow and poverty-stricken soil and poor pastures have been changed to deep, dark, fertile soil, and high-quality forage for cattle production. This has been achieved through ideas and methods that are quite outstanding but unorthodox. The properties of Yobarnie and Nevallan are Keyline-developed farms and were the forerunners of what is now an accepted farming system. This system in whole or part, and applied to different types of landscapes, has become widely adopted throughout Australia. My task is to describe why these two farms are so unique and to relate some of the history that lies behind Keyline. THE greatly changed landscape was not all improved at one. The owner had to reach out for a new appreciation of land shape, in detail, and over the whole large property. Geographers, engineers and all scientists who work with land must first appreciate and understand the meaning of land surface shape. They must have “an eye for country”. Now, every landscape consists in the first place of a series of small valleys, each a small water catchment. In turn, these combine in regular pattern to form a major catchment. Keyline “eye for country” begins with this first feature of the landscape – the smallest valley. Because it is of first importance, it is called the primary valley . This small valley will have its own rain run-off until it meets another valley. Surrounding this small valley is a neutral area, so far as water flow is concerned, which separates one primary valley from the next. This neutral area of no water flow, a ridge, has been called the primary ridge , and the whole combined – primary valley and the portions of the two adjacent primary ridges – becomes a primary land unit, and an entity by itself. This is sound geographical analysis. FIG.1. This diagram illustrates the terms used and the shapes of land in Keyline. Note that the Key points in the primary valleys are not on the same contour. The one on the rising landscape to the left is higher. Contours are in feet at twenty-foot intervals. Beyond this primary land unit there is another primary valley and its primary ridges, and probably several more. Arising out of the heads of the primary valleys and surrounding them there is a ridge or water divide. This has been called the main ridge. The main ridge divides one series of primary valleys and primary ridges from another. The most significant aspect of this analysis is that it involves a pattern, a recognition that smaller shapes are integrated to form a larger whole, and that this pattern might be repeated several times on a single medium-sized property. This pattern, too, could extend over quite large areas of Australia. It will be realized by geographers that there could be other large landscape types, but each would fall into some kind of pattern, depending upon the nature and structures of the rock formation, and the geological and climatic history of the land. In all probability Keyline thinking and planning could be adapted to these landscapes also. The anomalies of a glacial or sand-ridge desert landscape might prove the exception. The dam on the left of the picture is at an intermediate height in a primary valley. Above it, out of sight to the right of the picture, is another dam higher up on the Keyline of this valley. The small valleys indicated by the two drain lines are too small for dam construction, but beyond the small valleys and well into the picture is another primary valley containing three dams for irrigation water. primary valley changes its slope perceptibly at a point where rain run-off from the valley sides would collect together to form a small stream or torrent. It can also be seen, as one proceeds up the main ridge, that each primary valley’s collecting point is higher than the collecting point of the primary valley below. A line joining these points would rise as it progressed upstream. The appreciation of this fact is of the utmost significance to potential landscape management. FIG. 2. A contour map of similar land shape to that shown in Fig. 1, namely two primary valleys flowing into a creek and separated by a primary ridge. Part of the main ridge is shown at the 280-foot contour. Contour heights are in feet. by means of a contoured and scaled map. Contours on paper represent horizontal lines on the ground, or better still, outcrops of horizontal surfaces on a slope. They also denote heights above some fixed base level, usually sea level. Contours marked out of the ground would be level lines. On paper they would twist and turn, depicting valleys and ridges, steep land and level land. One can appreciate the shape of land from a suitable contour map of the land much better and more readily than one could from an examination of the land itself. Although these lines appear to be indiscriminately spread, this is not so. They follow very definite natural patterns. 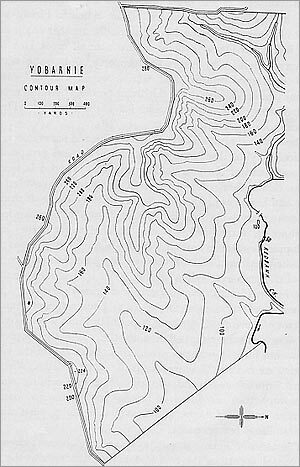 Within the pattern of these contours lie some of the secrets of Keyline, a unique method of land development and improvement originated by P.A. Yeomans. The word “Keyline” also designates a particular line. A careful scrutiny of a piece of farm land shows that in each small primary valley there is a point which separates the steep head of the valley from the more gradual slopes at its foot. It is the point, named by Yeomans and Key point, at which the valley first flattens out. A line through this particular point of the valley on a true contour or, in actual practice, at a slight gradient, is called the “Keyline of the Valley”, hence the name applied to this whole method of farm planning and development. This “Keyline of the Valley” does not apply to rivers or creeks, large or small, but only to the smallest valley of all. This first valley shape, this smooth-bottomed valley, which a farmer can work with his implements, this alone has a Key point and Keyline. Most settled landscapes consist of a series of such valleys, each one a small but complete water catchment. 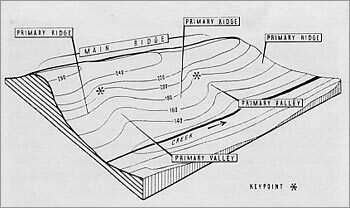 Called primary valleys because of their importance in the Keyline scheme, each has its own run-off until it empties directly into a creek or river, where the water runs between more or less confined banks rather than over a grassy bottom. Or the primary valley can empty into a somewhat larger valley, which itself flows into a creek or river. The primary valleys in the huge watershed area of a big river system will be found in considerable numbers, some falling to and shedding their water directly into the river, and others right through to the limit of the total catchment, miles or even hundreds of miles away, where they form and shed their water into the smallest streams, which themselves eventually feed into the river. For a primary valley to be a valley it has to be contained; that is, there must be a ridge on either side to give the valley its form. These ridges are the first ridge shape; in Keyline they are called primary ridges. These two land forms, the primary ridge and the primary valley, are classified in Keyline as the smallest units of land shape. Practically all agricultural land consists of these two shapes, plus the larger ridge rising above them and out of their upper portions. This larger ridge, enfolding as it does the primary valleys and primary ridges, is called in Keyline the main ridge. This main ridge is local and does not refer to a more remote ridge, as, for example, a distant mountain range. These main ridges are like the primary ridge and primary valley in that they can be found in large numbers near a river and right through the entire catchment area of a large river. To get a clear idea of a main ridge, picture the junction of any two small streams that you know of. There will be a ridge between them which continues to separate the streams as we move higher up the land. Eventually this ridge joins other ridges which in combination enclose the catchment area of each of the small creeks. In reverse, if we follow the course of the main ridge downwards to the junction of two creeks we will find that on both the right and left hand, primary valleys and primary ridges fall from the main ridge to the creek, each primary valley shedding its run-off water to the creek. In the foreground the overlapping spurs indicate the shape of a primary valley leading into the secondary. In this secondary valley there are three Keyline dams and three other dams. The feeder drain, obvious because it is under reconstruction, is leading towards the foreground to one of a chain of high-level dams in the primary valleys. See also Fig. 1 and the contour map in Fig 6. The photograph was taken from a main ridge, which swings around and comes into view again in the immediate background. big problem is made up of innumerable small problems. Again, each main ridge contains two or three, perhaps many more, primary valleys which are roughly similar in shape. As the primary valleys fall from the main ridge, the tendency is that their Keypoints have a rising relationship to each other as one moves up the general rise of the land. largest land unit considered in this analysis. Land has another dimension, namely length. Standing on the main ridge and looking along a primary ridge towards the creek below, this distance is called the “length of the land”. This length on Nevallan is four hundred yards; on Yobarnie it is longer, while on the gently-sloping country of western New South Wales it can be five or more miles. The significant aspect of this classification or analysis of land shape is the recognition of the fact that smaller shapes are integrated to form the larger whole, and that this pattern, in a suitable agricultural climate, persists and repeats itself indefinitely. For development purposes the elements of the pattern can be taken singly or they may be taken collectively in small or large groups. The significant point is that these patterns may repeat themselves several times on a single medium-sized farming property. The recognition of certain valley and ridge patterns in the landscape is not the totality of appreciation for these purposes. As stated earlier, each primary valley changes its slope appreciably at the point where run-off rain from the upper valley sides would collect together and form a small stream or torrent, that is, the Keypoint of the valley. It can also be seen that, as one proceeds up the main ridge shape, each primary valley’s collecting point of water will be higher and higher up the landscape. Furthermore, where the development of water resources warrants the construction of farm dams for irrigation, it may be possible to locate dams on the Keyline of these primary valleys (should they be found to be of suitable shape for this purpose) in such a manner that one dam would overflow, by means of a suitably sited drain, into the next dam in the neighbouring valley. extension of the Keyline of the lower valley in such a way that it forms the line for a feeder drain, or water transporting drain, to control the movement of overflow and keep all run-off water from the high country high on the property. It is the recognition of this geographical setting of the primary valleys the primary ridges and, on occasion, the secondary valleys, with their Keylines and Keypoints that enabled Yeomans to see immediately the tremendous significance of this pattern in his plans for total land-resources development, not only on his own properties but throughout Australia. I have found that this pattern is now being appreciated in many other countries also. KEYLINE planning envisages firstly the discovery and then the development of every natural renewable resource of the landscape in order to produce a state of balance which will be in conformity with land shape, climate and soil. The basic idea is to make nature assist the farmer instead of his engaging in conflict with nature, to his economic loss. There was a “balance” a slow rate of change, in the Australian landscape which preserved it from violent change until the early settler altered it and threw it out of balance, eventually causing more or less serious and widespread land deterioration and soil erosion. What the farmer and grazier need is not an unstable landscape but a permanent and improving one. As indicated earlier, working on land and planning on paper must be performed together as a system, and so a contoured, scaled map of his own property becomes the most fascinating and valuable document a farmer can have. valleys, primary ridges, main ridges, and secondary valleys, as he named them, was fundamental. He also recognized that there were individual Keypoints in every primary valley, and that a succession of primary valleys as one moved up the main ridge would have Keypoints at progressively higher levels. He saw that lines for feeder drains, really extensions of the Keylines of the valleys but leading from the high country, could control the run-off from this high country so that no water would be wasted to lower levels before all the high dams were filled. Yeomans called this the Keyline because he believed it would be the key that would unlock every problem on the property. This was a major step forward in thinking about land; it envisaged for the first time the maximum possible development of the water resources of farmland. In land development the contour map is used for planning in general, as in locating Keypoints, Keylines, and suitable shapes for possible dam sites, singly and in series. The contour map is primarily a planning map, and although it can be useful for specially recording from time to time work carried out on the property, it is not a substitute for levelling, drain grading, and so on. These works must be carried out separately on the various sites, and in accordance with the needs of each project. The Keypoints and Keylines are a patterned design, and so also are contour maps. But contour maps are based on accurate levelling to fix points and lines to landmarks on the ground, and transfer them to paper. The genius of Keyline designing is the matching of almost contour Keylines to the actual contour lines of the primary and secondary valleys, and matching extensions of the Keylines to the related ridges throughout the whole landscape. This in effect makes Keyline arithmetically correct and sound in principle, and it integrates the smaller land units, on the ground and on paper, systematically. THERE are several other important fundamental geographical factors in land-resources development. There is a relationship between precipitation and water flow, and between soil erosion and water flow. The location of dam sites, the supply of material for dam building and the location of suitable area for cultivation and irrigation are all dependent upon the past denudation history that placed deep soil forming deposits on the middle slopes. The most fundamental of natural processes is land denudation. Relentlessly, the elements disintegrate rock surfaces, transport the debris to lower levels and eventually deposit it in the sea. Rain run-off will collect in each primary valley on the upper middle slope and will begin to cut into the soil and erode it away. This is true of many Australian landscapes, especially those cleared for wheat and pasture production, and it is significant that at these water-collecting points, past denudation forces have left soil-forming deposits deeper than elsewhere up or down the slope. Here again is the recognition that water, land shape and soil deposits combine to suggest a site for a farm dam and protection against loss of both soil and water. Here is another geographical factor fitted to Keyline. This is land appraisal in magnitude at its best, namely land-shape and water-flow being dovetailed into patterns for water collecting and soil deposit utilization. The photograph was taken in December 1957 at the end of a severe drought period. to convert a reasonably permanent landscape to something very much less so? Australian rivers are now rising higher with floor rains, but they are retaining their water flow and volume for shorter periods than in times past. I think this could be attributed to wrong methods of land clearing and farm management, and also to the quick run-off that comes from roads and streets – a factor not present in early settlement times. Keyline has an additional contribution to make. Chains of high level Keyline dams, creek dams and other types of dams, together with Keyline irrigation, tree clearing, and hillside tree planting, are lessening the flood water entering our larger rivers. Flood waters in our larger rivers have, these last ten years, become so destructive that the problems of their control are causing acute anxiety to the people of our riverine towns. I am of the opinion that the strategically-planned farm dams of Keyline in increasing abundance on our sloping country must eventually make a major contribution to flood mitigation. FIG. 3. Each drawing shows by contours a primary ridge and primary valley. The heavy lines crossing the contour lines in the upper diagram indicate the path which water will take as it moves from ridge to valley. This occurs only when there is abundant run-off after heavy rainfall. Note that the lines are flat S curves. 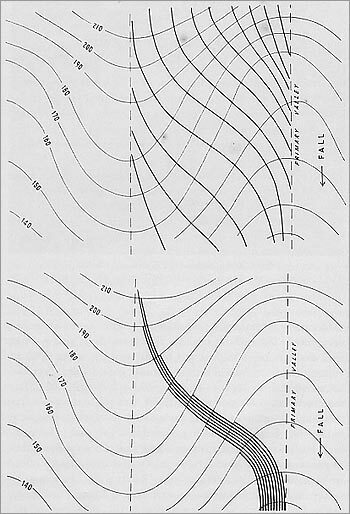 In the lower diagram, the important factor of increasing flow from ridge to valley is indicated by the heavy lines. THE system of cultivating land perfected by Yeomans involves another important factor, namely the geometry of Keyline. This is based on the various patterns made by contours on the land, which are consistent to a marked degree for each of the shapes classified in Keyline. Perhaps we can start our explanation this way. Heavy rain will at times cause water to flow over practically the whole of the land surface, and the movement of water is by the most direct downhill path from the primary ridge to the valley below it. On the contour map the most direct path is at right angles to the contours. This pattern of water flow is illustrated on page …… in Fig. 3. It will also be seen on the diagram that any abundant runoff rain water will remain for a longer time on the primary valley section than on the primary ridge section. In other words, the land is not “watered” evenly by rainfall which produces run-off – the valleys receive much more than the ridges. The resultant effect in the natural landscape is for the ridges to dry out quickly while the valley remains moist or even wet. Keyline Cultivation overcomes this natural flow pattern of water on land, holding the water on the ridges longer, and thus evening up the moisture content of the soil as between primary valley and primary ridge. Any cultivation of land, good or bad, will break this natural pattern of water flow. Cultivation can either concentrate it destructively or spread it more evenly and advantageously. The problem is to find a simple way of controlling this water flow. Keyline cultivation offers a solution by altering the natural path of water to make the first run-off move to the ridge, that is, away from the valley floor. Only when the pattern of cultivation is overcome by more or less excessive run-off does the water then follow its natural flow path downwards towards the valley bottom. FIG. 4. Two diagrams of a primary valley. Note the position of the Keypoints and Keylines in each. The solid lines are contours; the broken line represents Keyline cultivation. Note in the upper diagram two sets of cultivations. To the left, cultivation is downwards and parallel to the Keyline, and the arrows indicate the way the water will flow from the valley floor outward. This is the correct method of cultivating. The wrong method is shown to the right of the upper diagram. Whereby cultivating parallel and upwards from any contour other than the Keyline causes water to flow towards the valley floor, which is to be avoided. 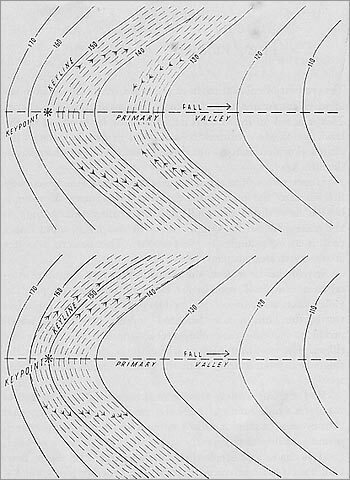 The lower diagram shows cultivation above and below the Keyline and parallel to it. This is again the correct method. Reference to the contour diagram of a primary valley (see Fig. 4) will show that the Keyline of the valley (which is marked in as an almost true contour) the contours are closer together in the centre of the valley than they are out to the sides; but below the Keyline, the contours are farther apart in the bottom of the valley than they are a little distance out, where the primary valley shape gradually changes to the primary ridge shape. In order to cultivate this valley so that the first flow of water will spread wider and move outwards from the valley bottom, it is only necessary to cultivate parallel to the Keyline up the slope. Above the Keyline of the valley the pattern of cultivation parallel to the Keyline naturally makes parallel lines which drift off the contour by gaining height in the centre of the valley, so that there is a gradual and increasing slope out of the valley as the parallel cultivation continues. Similarly, parallel cultivation from the Keyline downwards in the valley results in the cultivation lines sloping down and out from the centre of the valley toward the ridges, thus causing a wider spread of flowing water. 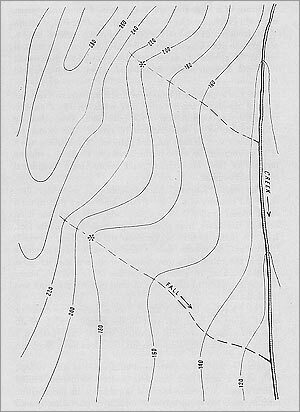 The second shape of the land, the primary ridge, is illustrated by contours on the diagram in Fig. 5. It will be noted that the sides of the ridge are steeper than the centre of the ridge. Therefore, if a contour line, or a line with a slight grade, is used as a guide line and cultivation proceeds up the slope from this line and parallel to it, then there is an inevitable tendency that the parts of a furrow on each side of the ridge will be higher than a point on the same furrow where it crosses the centre of the ridge. Thus water will drift towards the central portion of the ridge. One or more of these guide lines may be necessary for the ridge section, but no matter how many are used, Keyline cultivation simply progresses parallel upwards from any guide line on the general primary ridge shape. This pattern ploughing of Keyline is very effective in influencing run-off water, so much so that the primary ridge and primary valley shapes on the Richmond properties appear equally well grassed and have the same moisture content. FIG. 5 Keyline cultivation on a primary ridge. See page 21.
move water in the one direction, is very powerful. For other than rain pasture, this water movement is done with a purpose, namely to spread water in what is called Keyline Pattern Irrigation. To obtain this pattern of ploughing for Keyline cultivation the chisel plough is used extensively. The action of a chisel plough is simply a scratch type of cultivation which does not invert the top “live” soil and smother it, as is the case with the conventional mouldboard and disk plough. This cultivation by the chisel plough promotes the entry of rain water and air into the soil, and in combination with greater soil depth, increases its fertility. year, and once each year for the first three years only of development, it has the rather magical property of rapidly increasing the depth and fertility of some of the very poorest soils. It has advantages also on the deeper and richer soils. The whole purpose of Keyline cultivation is to change the critical air moisture relationship within the soil, thus creating a greatly improved soil climate. Again, by providing a better utilization of moisture on the ridges, the valleys are safeguarded because they are better able to absorb the reduced run-off. This is controlling a water resource scientifically. For similar reasons, the hazard of major soil erosion is eliminated, since the need for purely protective measures is entirely removed – and this of course greatly enhances the value of the whole property. Such is the logic of the geometry of Keyline as discovered by Yeomans. The implication of the previous paragraph is worth emphasizing again, because the wide and continued application of these Keyline methods first renews and then builds up rapidly and progressively the whole landscape. This by contrast is in open contradiction to the earlier, now out-dated methods of holding the soil by expensive protective structures such as contour terraces and grassed outlets to take water off land. These older methods are based in effect on completely negative attitudes to land development. Full control and maintenance of soil fertility throughout the whole year, which is what Keyline gives, removes the haphazard features from Australian agriculture, features which have been attributed to climate, to working large areas with insufficient labour, and to relatively low financial returns, all of which are believed to be beyond the farmer’s control. Keyline is control. THE conception of primary valley and primary ridge, main ridge and secondary valleys, Keypoints, Keylines and the geometry of Keyline, lend themselves in combination to further application. Since most soils in Australia are lacking in water, it becomes important to make more rainwater penetrate and to sustain within the soil more moisture, thereby extending the growing condition longer than could previously be expected. If this were possible then the first phase of the full development of water resources would be started. For Keyline purposes, types of land where farm implements can work are the most suitable. High, rugged and rough regions where this is not possible are still sources of rainfall run-off which can be controlled, collected and stored. The point at which control can be exercised best is at the Keypoint of each primary valley, and especially if the upper valley by its shape at the Keypoint lends itself to the storage of water in significant volume. Every primary valley which possesses a shape suitable for the storage of water may not have sufficient run-off to fill a dam even if one were constructed. But if the Keyline is extended around the next primary ridge above in the direction of the rise of the land, and if a feeder drain is placed on this line, then sufficient water can be collected. By using a chain of Keyline dams situated at topmost levels and constructed to overflow from higher to lower, valley by valley, water is maintained at higher elevation on the property, and therefore is more valuable than if allowed to spill into a lower dam in the same valley. The fall to get overflow water from one Keyline dam to the next one in a chain of dams, sideways as it were, may be only from one to three feet, whereas the fall from a higher to a lower dam in the same valley will be from ten to forty feet or more. On Yobarnie it has been possible to have dams at three levels, and this is the grandeur of the scheme. Firstly two chains of dams at Keyline levels; secondly another chain at a lower level, starting at a point where a small creek (see top of diagram in Fig. 7) enters the property, thus using water which originates outside and which would run to waste, especially in flood times; and thirdly at points where the excess water flowing from above would leave the property. These last are pumping dams. This three-tier system of water collection and water flow is an ingenious Keyline device for future farm irrigation prospects. To the casual observer looking at Figs. 6 and 7, it would appear that rather a large area of the property is covered by water and hence unproductive. But in such a climate as that of Yobarnie, with the probability of long dry spells in both winter and summer, water means money because water makes land development possible and profitable. When all the dams are filled the total area of land covered represents about five per cent of the property. When all this water is used for irrigation about fifty per cent of the property is irrigated effectively, part by part in rotation over the years as circumstances require. The cost of converting one acre of poor land into a good irrigation acre must be weighed against the value the improved acre would have in terms of production. Estimates of the value of irrigated land in Eastern Australia vary greatly. Without capital improvements and the annual cost of adding water, prices vary from two hundred pounds to six hundred pounds per acre and even higher, and available water costs about thirty shillings per acre foot. FIG. 6. A large part of the contour map of Yobarnie mentioned on page ….. The road to the left follows for the most part a main ridge. Note how the primary ridges fan out towards the right of the map from this main ridge, and note also the interesting shapes of the intervening primary valleys. Contours are in feet at twenty-foot intervals. FIG. 7. A functional plan of Yobarnie. This plan, to the same scale as Fig. 6, shows how feeder drains, dams and irrigation drains have been related over the whole property to the various land shapes. This Keyline plan’s chief function is to give full control of water resources. All the dams and irrigation drains are so placed that control can be done by gravity methods, the one exception being a large dam at the lower boundary, the water of which can be pumped out to irrigate a large strip of land above and to the right and to the left of the dam. Note position of pump and siphon. Though it is not possible to show the full Yobarnie plan on this small diagram, nevertheless this plan merits detailed study step by step with the text, because it epitomizes the full meaning of Keyline. value added by Keyline construction can be made from its animal carrying capacity. Yobarnie and Nevallan this last winter carried one bullock to two acres, and now that the whole plan is approaching completion and with the on-coming hot weather and the consequent good growth of irrigated pasture, they are expected to carry three bullocks per irrigated acre. That speaks for itself. Furthermore, these properties are in close proximity to good markets. Another rather important aspect of Keyline thinking, which will not be fully described at present, is the manner of designing and constructing dams. The special construction of the dam is an integral part of the development of the water resources of the property. Keyline dams, which are placed at the highest point in the primary valleys where water can be stored economically, invariably have land below the level of the bottom of the dam, and this area can be watered quickly and at low cost by Keyline pattern irrigation. The system of Keyline pattern irrigation depends for its effectiveness firstly on the proper location and design of the dam. Beneath the wall of the dam, at its lowest level, there should be a pipeline containing a screened inlet on the inside and a valve at the back of the dam, so that the water can be turned on and off like a kitchen tap. Actually, the pipe is laid early in the construction of the dam wall, and the wall is built over it. The diameter of the pipe is important; it should be of such a size that it will provide sufficient flow to empty the dam in a long dry period when irrigation is being undertaken. Too small a size of pipeline would not irrigate quickly enough to use up all the water of a large storage as it is required. Our present experience in Keyline indicates that an eight to ten inch diameter pipe is adequate and efficient. A further aspect of water utilization is an efficient pipe system. Yeomans has found it necessary to reconsider the techniques of laying pipes in dams and to devise methods to prevent seepage. He has labelled it the lockpipe system. In lockpipe laying, locks or barriers at various places along the length of the pipeline prevent water movement along the outside of the pipe (a common weakness in other pipe systems). By this means the dam wall is strengthened, and any subsequent likely failure is eliminated because the wall is self maintaining. Secondly, Keyline pattern irrigation depends on the location, design and construction of the irrigation drain. When the lockpipe valve is opened, water enters a drain placed to receive it. This drain has been constructed at a set grade in the down-land direction. When irrigation commences, the water is blocked in the drain with an ingenious and easily manipulated stop. Yeomans has called it an irrigation flag. This flag forces the water to build up and flow over the lower lip of the drain along a selected portion of its length. The word “flag” may be puzzling, but because the stopper is made of fabric the name flag is more appropriate than stopper. The conventional title would be check dam or drain stop. In Keyline pattern irrigation, three or more irrigation flags are used. While one flag is operating and holding water back, the second flag is placed in position further along the drain in order to receive the water after the first flag has been removed, thereby causing a spill-over in a new place. A third flag can be put in at the same time further along the drain, or alternatively, it may be put into a full drain at any particular spot during irrigation. Thirdly, Keyline pattern irrigation depends on Keyline cultivation patterns. The area of land to be irrigated has previously been Keyline pattern cultivated to control the water, spreading it out rapidly but gently across and down the slope. Thus, with the aid of the irrigation-flag method, many acres can be watered each hour. By operating in this fashion the need for pumping is eliminated. Gravity, plus the earlier Keyline pattern cultivation, plus the volume of flow, does the work. As the water spills and spreads from each flag, it moves down the slope towards the lower limit of the possible irrigation area within the paddock. When the downward lip of the flow reaches a predetermined distance, then the first flag is removed; the water flows on and backs against the next flag and starts to spill as before, the process continuing around the paddock away from the dam. By this means, a wide area is watered quickly and in a very economical fashion. The following four photographs of Yobarnie illustrate the control of water in Keyline pattern irrigation. PLATE 7. Upper. An irrigation drain with two flags in position and in readiness to hold the flow of water. Lower . The flow water from the dam moving along the drain under gravity has reached the first flag, filled up, and commenced to flow over the lip of the drain. In Keyline, all fences have to be carefully placed in relation to water collection and distribution. The fence in this picture marks the upper limit of an irrigation paddock. PLATE 8. Upper. An extension of the area below the spill of the previous picture. In this instance, the length of the spill in the drain is fifteen yards, and the water has moved down the slope sixty yards and across the slope a total distance of forty-five yards. This irrigation took eight minutes from the time the water started to spill. The reason for the increased distance that the water will flow across the slope is because the ground was Keyline pattern cultivated before the water was put on. Although this area has been irrigated several times the cultivation pattern is clearly visible in the preceding photographs. Lower. The phenomenal growth of vegetation. This paddock, containing clover and grasses which had been previously sown and irrigated, was eaten off eleven days earlier, when it was again irrigated. The effect of this irrigation is shown in the abundant growth of pasture. The people are, left to right: a visitor, Dr Graziani of Italy; P.A. Yeomans, and the Author. A similar system is used where dams have had to be placed low in the landscape, and there is not a sufficient area of land below them for flow irrigation. Then a medium-head, large-flow-volume pump lifts the water from the lockpipe valve to the irrigation drain, which has been placed higher up and designed to irrigate a prepared area below it. In the determination to catch all the excess flow by lower dams, the combination of pumping and gravity-flow irrigation completes the utilization of all water that can possibly be collected. What does all this amount to in the twenty-six-inch rainfall country of New South Wales? For example, gravity irrigation, as described above, may be done five to nine times a season or whenever necessary. Surely here is the very bogey of flood and drought laid forever. Likewise full security is guaranteed for any farming and stocking policy, and at very reasonable costs. This is the geography of Keyline – that in a twenty to thirty inch rainfall area, especially if some of the rain is of a thunderstorm type, an integrated Keyline system, with its farm dams, feeder drains (to fill the dams), irrigation drains, and pattern cultivation to control the irrigation water, will provide a constantly moist and aerated soil climate, which in turn will develop rich, deep soil from the most unimpressive rock debris. Abundant, easily-produced and high-quality pasture soon becomes available, in a relatively cheap fashion, at the turn of a tap. training of personnel and the finding and developing of the right type of machinery to do the various jobs efficiently and economically. Farming in the past has not always been doing the job in the best way, but a choice of several ways and accepting the least disadvantageous. Unfortunately, there comes a time when a whole new system has to be adopted and its costs met; but then there is the added cost of amending the earlier work. The long background of previous efforts to find a solution to the problem of land planning and development is the present guarantee of the rightness of Keyline thinking and of Keyline techniques. Many of our earlier ideas and practices seemed right at the time, and many people were using them as well as ourselves. It was not that we did not know what we were doing. There was plenty of knowledge and experience among us, yet something was wanting. Farm and pasture properties in Australia are seldom near full development and much land still awaits even the beginning of development; so the search went on, often waiting a year or more to see if a project would prove successful. One clear idea emerged – that if land was to be made better and new wealth brought to rural industries, then a whole new attitude to working with the soil had to be forthcoming, and new, economical techniques had to be established. What these attitudes and techniques would be was not so clear at the beginning. mining and business, second from his wide range of practical experiments and his mistakes as a former enthusiastic conservationist, and finally from the full development of Keyline, that it is must plain good business for people on the land to follow Yeomans and the course this book so earnestly urges. You may disagree with his theories and ideas as much as you like, but if you let your disagreements be founded on real knowledge and understanding of his work, then your property will surely benefit. Furthermore, developing land in this way is an attraction to people going on the land, since knowledge, experience and hard yet pleasant work not only provide a very good living, but one eminently satisfying. 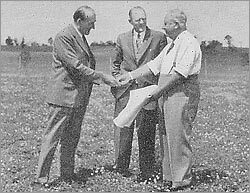 In the late 1930s the Department of Geography of the University of Sydney decided to make a major land-use survey of the Tamworth region of New South Wales, and the Carnegie Corporation of New York, through the University, provided the money for the execution of the work. During the course of the survey I became very interested in the problems of soil erosion, which were receiving very little attention in this country at the time, although country people must have been aware of their seriousness. During our discussion with farmers as the survey proceeded, we persuaded one farmer to try out some of our ideas on erosion prevention. Now, during this period much soil-erosion literature was coming forward from the U.S.A. It appeared that the main purport of their schemes and devices was to catch surplus water and drain it away off the farm to some place where it could not do any harm – a quite elaborate and expensive procedure. 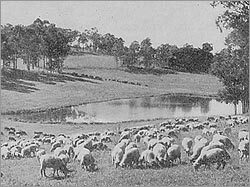 It was evident to us, however, that in the dry climate of New South Wales it was necessary to keep as much water as possible on the land. We devised simple structures to this end and met with some success, provided the farmer would maintain the shallow drains year by year. We were asked over the next few years by other farmers to give our advice about their soil-erosion problems. Then the creation by the New South Wales Government of the Soil Conservation Service (in which I had some considerable say) about this time, allowed us to turn our energies to other geographical studies. I thought our erosion work was of wide interest and importance, and I published an account of it. Later I collected our material and published it in a more generalized book called Soil Erosion in Australia and New Zealand. Before the book was finished, however, I had become associated with P.A. Yeomans, who had started his work on the Yobarnie section of his property, and I was privileged to describe in my book some of this work. He had purchased the land a year earlier and had started work on the principles of conservation when a disastrous bushfire swept through Yobarnie and the foothills of the Blue Mountains in December, 1944, and left the land in a very poor state. As a mining man with some contact with farmers on their own properties, Yeomans had become very interested in the problem of soil erosion which he had seen on many farms and grazing areas. Immediately on his purchase of land, he invited the heads of the then recently-formed Soil Conservation Department to visit him, which they did. Their comments and advice about the property were considered by Yeomans to be negative and pessimistic, and so he decided to proceed alone with a general policy of soil conservation which had, for those days, a new twist. Whereas the approach of soil conservation is generally applied to getting rid of water safely, he decided that it would be a better proposition to hold, store and use for irrigation as much of the run-off as possible. The many who have visited Yobarnie, and Nevallan which adjoins it – and they have been very many – and have seen the wondrous state of the soil, pastures, and water-resources development – and it is without exaggeration a matter for wonder – must realize the courage of the man behind Keyline. surfaces, with deep gullies and holes in the valleys. When high wind and heavy rain followed some weeks later, two of the dams were completely filled with ash and debris. Much of our work went on contemporaneously. The gullies were smoothed and the holes filled in with materials from nearby pockets of earth. Contour terraces were cut out of the raw sub-soil and shales on the hillsides, and were graded to allow water to flow into the dams, which were even in that year all equipped with four-inch pipelines beneath the walls, a forerunner of the present lockpipe system. The areas between drains were ploughed with conventional equipment parallel to the drains and contours, and pasture grasses were sown down. 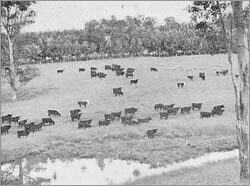 Although there were some interesting strikes established, the pastures which were supported only by the rain that fell on them failed to persist. It is interesting now to look back on the many and varied implements that were tried for the purpose of constructing with reasonable accuracy the many earth terraces and water conservation drains running to the dams already under construction. Yeomans was often using the equipment to build the dams and drains himself. Whenever it rained there was plenty of run-off to the dams, because practically none soaked into the land. To get more water into the soil over a large area quickly, Yeomans, who had engineering and coal-mining interests at this time, constructed a large heavy spiked roller and some areas were gone over. The method proved to be unsatisfactory. What was needed was something to really fracture the hard sub-soil. In this North Richmond area, months can go by without any rain whatever, and earth gets like concrete. During that year and the next, about twelve or thirteen irrigation dams were constructed. Visitors who came to see the soil and water conservation and irrigation in those early years were apparently very impressed with the work and immensely intrigued by the flow of water from the four-inch pipes beneath the walls of the dams. There is no doubt that green pasture and spray irrigation in an otherwise dry landscape makes a spectacular and very pleasing sight. Evidence of the large amount of work done then was recorded by Adastra Airways in 1948. 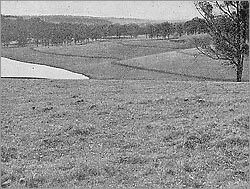 The subsequent picture, which many people have seen at Nevallan, shows the property covered with grassed feeder drains to the many irrigation dams. Yeomans became very preoccupied with spray irrigation, and an earlier spray line was improved with the addition of better spray heads; later this was made portable and another long spray line was added. Subsequently, wheels were incorporated in the design, and the spray line in fifteen-chain lengths could have been moved many miles if that had been necessary. Also, six-inch asbestos cement mains were laid underground for a mile and a half from a ring dam constructed on the main ridge of Yobarnie. The ring dam was connected by another pipeline to a pump set up on a large lower dam, which in turn trapped the flood flows of a creek. Thus a very considerable area of the property could be spray irrigated. Later in 1947 several of the large monitor-type spray-head stands were added, each spray head watering over an acre of ground from each position. They were the first I had seen and made an impressive sight. While the various methods of pump and spray irrigation continued, gravity irrigation also received a good deal of attention, and some interesting experiments were made at this time. From one large dam at the head of the first valley of Yobarnie, water was let out through the valve of the four-inch pipe into an irrigation drain which, from time to time, was earth-stopped, causing overflow flood irrigation to take place. This is known as wild floor irrigation. The effect was sometimes patchy, with a mosaic of brown and green blotches on the hillsides. 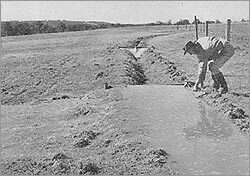 Irrigating with contour drains or furrows produced a much more uniform spread of irrigation water but this method proved to be costly in manpower. 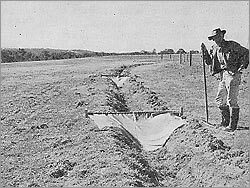 Furthermore, the many irrigation furrows required presented obstructions to the economical working of the paddocks. Water from the same drain was also picked up by a pipeline from which spray lines down the field were spread. The resultant growth of vegetation from this gravity spray system provided at critically dry times the green feed needed for stock. 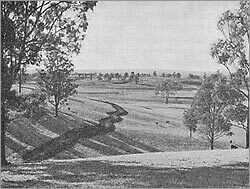 This extensive irrigation on Yobarnie, embracing many variations of both spray and flood irrigation, was the first carried out on the undulating land in or around the County of Cumberland, and from farm-stored water. 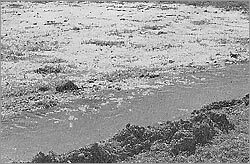 There is no doubt that the early Yobarnie techniques of offsetting the limitation of a catchment by constructing feeder or water-conservation drains to tap the run-off from wider areas outside the valley catchment, and then storing that water in a dam, have had a profound influence throughout Australia. This is shown by the growing interest of farmers in the development of their own water resources for irrigation purposes, and in the reorganization of their properties as a whole. It always takes considerable time to properly cost new farming operations, and the early, rather exciting results of spray irrigation needed to bear the test of cost in relation to return; only time would tell. So it became evident to Yeomans that spray irrigation for pasture in the production of beef cattle, without a good rain pasture to back it up, was not economically attractive. Better methods of water utilization, and better methods of soil, pasture and land development generally, were still necessary. Again it was noticed that the pastures, despite the use of fertilizers in the conventional fashion, but not provided with irrigation water, failed to persist. It was realized that much more moisture had to be taken in by the soil if good rain pasture was to develop. In the same year Yeomans constructed the first version of the chisel plough which he was to use on the property. But without our present knowledge of how to use this implement in relation to the progressive soil-development techniques of Keyline, the pastures still failed to persist satisfactorily. 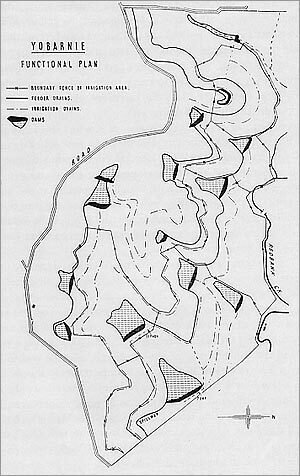 contour system, which was subsequently and independently marked out on the ground. P.A. Yeomans provided and financed the senior students’ work and permitted hundreds of young geography students to understand contouring in relation to landscape and to learn as well about other matters on the property. His kindness and assistance are much appreciated. Following the mapping, we decided to open up the soil “good and proper”, and so a large crawler tractor and heavy construction ripper were used to deeply rip up several acres. We believed at the time that the first result of this work was an unqualified success. When heavy rains came, the deep contour rips trapped the water, and shortly afterwards the place was covered by tall green grass. During the next year or two, seven hundred acres were treated in this fashion. Because of this first apparent success of contour deep ripping for rain pasture, we decided to clear and commence the development of some of the back paddocks which were tree covered at the time. It was also decided to leave strips of timber on the contour in the clearing, which we called “contour strip clearing”. We even spoke then of the “Yobarnie methods of soil and water conservation” and later an article was written with this title and printed by the Australian Geographer , Volume V, No. 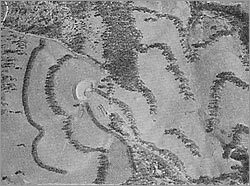 8, 1950, from which I quote: “The Yobarnie methods include some of the usual procedures such as contour terracing, but we claim that our application has been unique for the class of country, while contour tree-clearing and contour ripping have not been tried before anywhere in the world as far as we are aware”. was appointed full-time to implement the work. Much other work had also been carried out and a second creek dam was started. Very heavy rains occurred in January, 1949. On one Saturday and Sunday, six inches of rain fell and saturated the ground, setting the valleys flowing. On the Monday morning four and three-quarter inches of rain fell in less than an hour. Higher up the creek and outside Yobarnie, several dams were washed out. The phenomenal rains and this flow from above caused both the dam under construction and the older one just below it to break through. This appeared to me at the time to be a major setback, but it was not so to Yeomans. One could almost imagine he was pleased that the breakages had occurred, since he immediately commenced the replanning of the dams which were high on the slopes and not in the creek. It was the usual practice of water engineers to base the design of such dams on the minimum annual run-off. Yeomans decided to reconstruct and in future build such dams to the estimated maximum rain run-off. He continues to maintain that this is the logical view for farmers in low rainfall areas. The property for some time now had appeared to be in good heart and visitors who came continuously to the farm seemed to be tremendously impressed with the work. 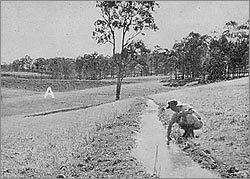 While irrigation experiments were now changed more to gravity flow methods, pasture improvement became an even greater necessity, as without satisfactory rain pasture, reliance on the more expensive spray irrigation did not show promise of much profit. Most of this major water conservation work was done on Yobarnie. Our thinking had never allowed for the “safe” disposal of water off the property, so now our techniques of storing water and irrigating made no provision whatever for carrying excess water off the property. were ploughed into the soil with the idea of improving its fertility; the other paddock of the natural, poor, short pasture, and soil perhaps better described as sub-soil, was chisel ploughed. Ploughing in with the disk implement of the sudan grass and peas failed to change the texture of the soil or its colour in any way, while the chisel-ploughed cultivation of the poor, natural pasture, when followed by almost one inch of steady rain, resulted in the quick incorporation of the old and dead pasture roots into the soil. This was succeeded by a very rapid change in its colour and texture. However, this soil soon deteriorated, but with a difference. Yeomans recognized that if this rapid soil change could be repeated several times on poor soil, it might be induced to persist. If that were to happen he then would have a basis and a technique for the development of a really worthwhile rain pasture. Further ideas followed, and all those years of preoccupation with contours must surely have been the basis of the inspiration which caused Yeomans suddenly to “see” and to understand the hitherto unappreciated patterns of land, which in turn led to the rather amazing use of this new scientific discovery in the control of rain water, and to the answer to the simplest of all questions; namely, which way should water flow? It is strange to think that this true basis of the development of Keyline landscape had remained so long completely unappreciated by anyone. Yeomans then felt that he had what he had been searching for all along – a way to improve soil rapidly and economically , in accordance with a plan which could be worked out on paper and applied to any area of land as a master plan for its development. The conservation approach was finished with. It was to be replaced by something much more constructive. clearing of Nevallan, which left tree strips on the lines of the earlier contour strip clearing of Yobarnie, most of the trees or suckers broke off at the weak zone near the old stump. It is quite usual now to see in Nevallan’s tree belts an eight-inch thick sucker tree growing out of what was a three-inch stump. Perhaps hundreds of trees broke off in this way, leaving many stumps in the ground after the clearing and burning-off was completed. Fortunately, the new chisel plough, redesigned by Yeomans from the earlier implement and given a new resilience instead of a rigid build, had proved successful. Later Yeomans introduced this chisel plough to the Australian farmer and grazier. Apart from its use in Keyline, it has since become quite an outstanding implement for erosion prevention and in land development generally throughout the whole of Australia. As a result of the work with this plough we now knew that rough land could be cultivated without breakages of the implement, and moreover a small tractor could pull it. Naturally enough, after two to three years of Keyline cultivation with the chisel plough, stumps which had been regarded as too difficult for the bulldozer to remove were eased out of the ground with the chisel plough and a small tractor. Yeomans at this particular time was able to give much more of his personal attention to the work, and the development of the Keyline plan forged ahead. He had what he considered the perfect implement for his new soil development technique, and a plan, rapidly showing signs of perfection, for the organized development of the property. Moreover the problems of flow irrigation from the original four-inch pipe in the dams had led to experiments with much larger flows. Likewise the newly devised Keyline cultivation methods, which when irrigating from the larger pipes controlled the even spreading of the water and which required little manpower, had now completed the solution of the irrigation cost problem. who had shown an earlier interest in “the Yobarnie methods of soil and water conservation” and land planning in general. On this occasion, Yeomans took us over all the new work on Nevallan, and spent a good deal of time in explaining his new planning techniques, the methods of developing soil, the design for the location of water storages, feeder drains, irrigation drains and irrigation paddocks, and the relation of tree belts to these factors. The soil he dug for us was a revelation. It was obvious to me that a completely new system had been perfected. The new method would not only completely control and collect rain water falling on the property, but develop every resource of the land to its maximum possible extent. The new ideas and relationships of land shape for the siting of the various types of dams had become established practice and the earlier pipe system of the original dams had become the lockpipe system. I think my friend, the engineer, was impressed and I was started into uttering, “You now seem to have the answer to everything”. Worthwhile results were now very obvious. On Nevallan the three-year “course” of Keyline cultivation, which simply meant the Keyline cultivation of the development pasture paddocks each autumn for the first three years, had developed an extraordinary depth of dark soil just teeming with soil life, while the pastures were thriving. The original Keyline area of Nevallan can now carry a bullock to the acre of improved land throughout the winter and, of course, more in the summer. This is more than ten times what the land could originally carry, since it had been considered practically worthless. the costly mistakes inevitably associated with new ventures. There is no doubt that Yeomans gained much experience from his early, enthusiastic embracing of the principles of orthodox American soil conservation methods of the day (which have since been largely adopted in this country to no great advantage as I see it now). One can also realize that if Yeomans had undertaken normal soil conservation work in a better agricultural environment, instead of in the poor Wiana-matta shales and unreliable rainfall of the outer County of Cumberland, these methods might have been successful enough and he would not have experimented further. Perhaps it was fortunate for Australia that his early soil conservation work was unprofitable, since he has found that practically every method of soil conservation he first used was opposed to the ultimate full development of the farm. Yeomans and I were among the first to apply soil conservation methods extensively in Australia, and of course he had spent a good deal of money on these various structures and methods of soil conservation. In the final development of Keyline, he must have spent a further considerable amount of money in just getting rid of the banks and drains and other structures of soil conservation that he had put in earlier on Yobarnie. We had always agreed that in an agricultural climate with only twenty-six inches or so of rain each year (and it dropped to seven inches one year), it would be necessary to hold every drop on the property. Our planning and development, even when it was wrong, was always based on the idea of using this water, and never on the idea of getting rid of the surplus. How could one conceive of a surplus in such a climate? If water does have to flow from the land because of prolonged torrential rains, then the methods and techniques of Keyline will prevent any considerable soil removal. of the plot type of experiment so characteristic of experiment stations – rather was it the reverse; all experiments were paddock style and covered a wider range of work because much of it was entirely original. The earlier dams, with their small pipes, were completely emptied and drained, and in each case a large cut was made through the wall for the laying of the new, larger pipe of the lockpipe system. Some dams were relocated and new dams were added. I think it is very fortunate for this country that Yeomans, with his mining engineering knowledge, his critical analysis of his own work, his willingness to correct anything which he later regards as a mistake, and his financial stability, was in a position to continue the work to its final and rewarding stage. Keyline farm development then is not some grandiose scheme to put on a property all at once, yet Keyline overall planning should be undertaken courageously. Just as the primary valley fits into its place with the main ridge and the primary ridges and other primary valleys, so the farmer, having planned overall, can start with one unit of his property. When this becomes profitable, as it surely will, he can advance with the assurance that the first work will marry into the second and not have to be remade. If the development of his water resources involves farm dams for irrigation, then the first dam must fit the whole plan of development. When this dam pays, the farmer will want and be able to develop his resources further. A bit at a time is the way to successful accomplishment, but Keyline plans the lot before starting. This is the other aspect of the geographical basis of Keyline. By making use of contour maps, such things as farm structures, dams, drains, tree belts, cultivation and irrigation can be plotted and seen as a whole and in relation to each other. This, too, saves time and money since the work on the ground can be arranged before starting, and not just in the usual haphazard fashion. Furthermore such a map kept at the homestead is a useful tool and an abiding joy. protection. Keyline is land development at its best, and development is progress. Soil conservation is stagnation, and may even be retardation. Again, Keyline means a new philosophical outlook. Land is to be lived on and enjoyed, not to be lived off and destroyed by wrong practices in an effort to gain a precarious livelihood. It seems to me that, as things are at present on the land, farmers cannot get their costs down (at least sufficiently to meet the situations facing them), and so productivity must go up. The question is, can land, as it is and as it is being used now, be made to yield higher returns? I very much doubt it, and reliance on excessive quantities of artificial fertilizers will prove no solution. The worthwhile alternative is Keyline, which I see as an abiding, self-renewing, highly productive enterprise, and a very satisfying adventure. DURING the early years of the development of what I once called “The Yobarnie methods of soil and water conservation”, large numbers of visitors came to this farm to see our soil and water conservation work. It was not until August 1952, a far cry from 1944, that there came an opportunity to make a large public display of the new principles and practices of Keyline. During this month, two fairly large parties visited the property together; the one which I led was made up of members of the A.N.Z.A.A.S. Congress (the Australian and New Zealand Association for the Advancement of Science) then meeting in Sydney, and the other was a group from the State Liberal Party’s Rural Movement. Here was an occasion to be welcomed. graziers to come, see, listen and criticize and, with the growing awareness of Keyline in the community, their numbers greatly increased. Government departments were encouraged to send their staff along, and they did. Schools, colleges and universities sent groups of students which were conducted over the properties. Farm walks, instituted for Sunday afternoons, must have been a source of pleasure and inspiration to hordes of people from far and near all over Australia, and also to many visitors from other parts of the world. Here was something to be seen, and even to wonder at. Perhaps more interesting still was to meet Yeomans and his men, who were so enthusiastic about their work, and still are. The first Keyline book, entitled The Keyline Plan, was written by Yeomans in 1954, with an edition of ten thousand copies, which is uncommonly large for an agricultural book. This book was soon out of print, but Yeomans decided not to publish a second edition, as he considered a more complete exposition of Keyline was necessary, and, since this first book was very favourably received, it had served its purpose. they have been exhibited and admired by the public on numerous occasions. However, Yeomans decided that a new book was necessary, though it was not until the latter end of 1957 that he had sufficient time to complete it. I had the opportunity of reading it in manuscript form and also had the pleasure of checking with him what is to me the quite remarkable chapter – namely, the “Keyline Scale of Permanence”. The eight succeeding chapters, embracing the factors of Keyline scale, were equally illuminating and are worthy of anyone’s perusal. They are respectively entitled “Climate”, “Land Shape”, “Water Supply”, “Farm Roads”, “Trees”, “Permanent Buildings”, “Subdivision Fences” and “Soil”. These chapters display a revolutionary but fundamental approach to the problems of agricultural land planning. This new book, The Challenge of Landscape , was published just before Yeomans left with his wife and youngest son on an overseas tour. During this tour he took the opportunity of comparing his theories with the various types of agriculture seen in Europe and North America (which country he had visited on a previous occasion). Fortified in his opinions that Keyline principles had as wide an application as he had earlier envisaged, he returned to give even more vigorous attention to the complete Keyline reorganization of Yobarnie. In his book, Yeomans set out the philosophy of Keyline, its principles, practices and development, and gave answers to technical controversies that had arisen. This book was well commented on by overseas journals as well as by those of Australia. I had the privilege of taking some of those books to America and Great Britain in 1959. It was interesting to find that my geographical colleagues had never appreciated that land shape, climate and soil climate had a relationship which was fundamental if land resources were to be fully developed and made economically successful. The long, dry English summer of 1959, when that “green and pleasant land” was like a parched, drought-stricken landscape in Australia, brought home to farmers and others the values that Keyline could have offered had it been in operation. The Keyline work goes forward, but on a more extensive and growing scale throughout Australia. The near perfection of Nevallan has now spread over again to Yobarnie, and although its soil structure is still behind the fertility of the originally poorer Nevallan, its development potential is greater. Yobarnie remains to me the most remarkable property in Australia, because it has been the subject of longer study of farm water resources development than any other I know of. It now represents, with the new Keyline plan indelibly etched on its hillsides, an immense fund of experiment, development and information. It is rapidly becoming a “copy-book” view of the Keyline vision. Other properties have been bought by Yeomans, especially one at Orange, where the size of the area, slope to slope, and the various types of climate and soil, offer splendid opportunities. Many farmers who came, saw and read, have gone back to their own properties and are reorganising them on Keyline. Big companies interested in land development have had a good look at Keyline and are going ahead on these lines. Every endeavour has been made by Yeomans to meet requests to assist farmers in planning their land on Keyline. Many of these converted farmers visit each year the original but constantly improving properties of Nevallan and Yobarnie for further study and renewed inspiration. Yeomans realized that land planning was initially and fundamentally dependent upon a knowledge of geography and climatology. To utilize this knowledge effectively he devised with rare insight many methods which were derived from his unique ideas of agricultural engineering and his machinery inventions. These in combination make the broad scope of Keyline methods and ideas far and away the most outstanding achievement of recent times in the agricultural and pastoral industries in Australia. health aspects of Keyline, though these in themselves are of tremendous significance. So my book is by no means a full exposition of Keyline. A full exposition is at present only available in Yeomans’s own book, The Challenge of Landscape , subtitled “The Development and Practice of Keyline”. It is surprisingly difficult to break through the solid wall of prejudice that surrounds conventional agricultural practices and those whose business it is to maintain them, yet, despite severe apathy, Yeomans has anxiously and pragmatically offered to permit any scientific and economic investigation of his principles and practices of Keyline. Moreover, he would actively support such tasks. In short, he claims, and I believe rightly, that he can show rational proof of all aspects of Keyline planning and complete landscape development, but that full scientific proof is outside his field. This proof can, and should be undertaken by the appropriate scientific authorities, if for no other reason than that Australian rural development at the moment is in a very parlous condition. These State investigations or those made by other authorities could be very worthwhile, since Yeomans claims to have made deep, dark, fertile soil over hundreds of acres which were originally, at best, poor, grey, very shaley solids, and at worst, yellow sub-soil, or yellow shales and even blue hard shales of the Wianamatta series, all exposed by previous soil erosion. The rational or commonsense proof is simply to seek confirmation from the very many people who still know the earlier condition of Yobarnie land, and then to go and dig up the present soil with a spade and see what condition it is in now. Perhaps this is not sufficient for some scientists, and so it is their obligation to use their own methods and abide by their findings. Yeomans claims that this rich, fertile soil was produced by what he calls “Keyline progressive soil development”. Surely the agricultural scientists can satisfy themselves by applying Yeomans’s methods under Yeomans’s direction, but under their own supervision on some of the many thousands of acres of poor soil derived from Wianamatta shale and readily available to them in many places in the County of Cumberland. directly from rainfall and by flow irrigation through his technique of Keyline pattern ploughing. 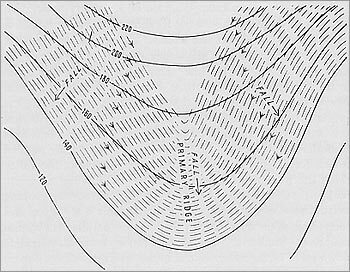 One sensible method of proving this is simply to ask Yeomans to release water at the rate of one hundred or two hundred thousand gallons per hour on to a pattern ploughed ridge, thereby demonstrating that the process works exactly as he describes it. Perhaps the scientist requires more than this visual evidence, and Yeomans is prepared to co-operate with him to see that he gets it. Much controversy has arisen over methods and purposes of farm-developed irrigation in low rainfall areas. It is necessary to make it clear here that irrigation methods suitable to humid areas, in which “supplemental” irrigation is used to overcome short drought periods, are wrong in principle when applied to low rainfall areas. For these latter areas Yeomans has demonstrated that the best of all irrigation systems involves what he has called the full utilization of all the water resources of a property. This system is effective especially on a property with long, gently undulating slopes. to us, should be substantiated by outside scientific observers. Because the whole Keyline scheme has had such public acclaim and because of this soil transformation, it is in the national interest that a major investigation be undertaken. It is not too far from practicality to suggest that our State Conservation Departments should reconsider their functions and replace their conservation policies and techniques by the more necessary ones of development. This could well mean a new combination of the Public Departments of Agriculture, Forestry, Water Conservation and Soil Conservation. The matter is of sufficient importance for Australian State Governments to initiate new policies of rural planning and land development. And so the battle goes on. It has been my privilege to have been associated, at times very closely, with P.A. Yeomans in his early experiments on soil and water conservation and spray irrigation, and subsequently in his constructive methods of Keyline development. My own reversal of opinion from soil conservation to Keyline construction is as definite as is P.A. Yeomans’s own. Of course, there is much more to be written about Keyline. I hope one day to write the full story of Yobarnie itself, and illustrate its complete and dramatic transformation by the planning and development methods of Keyline. It would be interesting also to have a written record of the many other properties flourishing on Keyline.